NorthernAxcess offers the Iridium 9555 Satcom ASE docking station Bundle that includes a Refurbished or New Iridium 9555 satellite phone, Refurbished ASE DK075 docking station and a NEW VTECH 6.0 Cordless phone. This bundle is an ideal solution to use your satellite phone in your office, vehicle or vessel. The ASE DK075 Docking Station provides an exceptional solution for using your 9555 Iridium satellite phone indoors and outdoors. Just dock your 9555 Iridium phone in the docking station and you can access satellite communications with the VTECH cordless phone. When you need to leave the office, just un-dock your satellite phone and take it with you. Always be in touch outside or indoors. Note: The Refurbished ASE docking station comes only with the AC- Wall Charger and is compatible with the Iridium 9555 Satellite Phone. We have competitive prices and guarantee to provide quality used and refurbished satellite equipment, count with a 24/7 support team and the most qualified Repair Centre in the satellite communication industry. We also carry a full inventory of accessories for this docking station. Refurbished and Used Satellite Equipment come with a 90 Day Warranty. You also have the option to buy this bundle with a New ASE DK075 docking station. Please review price above. NorthernAxcess provide the latest in high quality satellite communication equipment for use in any situation, or remote location worldwide. The docking station’s advanced ergonomic design, small footprint, and array of attractive and up-to-the minute safety features place the ASE-DK075 into a league of it’s own. This docking station is simple to install with no extra components to hide which keeps installation uncluttered. RJ11 Connect (ASE-DK075 only) - Connects to an analog phone (single or PBX) including multihandset wireless phones. Use of a cordless phone with expandable handsets can provide up to eight units within a two-mile range (unobstructed) from the base station. Handset Connect - Corded Intelligent Handset (optional) offers a convenient wall-mount privacy Handset with audio enhancement circuitry to provide excellent voice quality. USBConnect - USB port for data connections including Internet connection with Direct Internet 2.0. Built-In Charger - Keeps handset fully charged for immediate use when un-docked. Real-time System Status Indicators - Large Icons allow status viewing from 25'. Smart Dialing - The Docking Station knows the correct format for the country that is being dialed and places the call once the number is entered. Smart Dialing eliminates the superfluous "00" IDD code (no more international dialing sequence). Simple Operation - The Docking Station combines clear LED status lights with the Iridium handset's graphical display for setup, troubleshooting, programming, and operation. Base Station Ringer - Audible ringing to alert of incoming calls. Versatile Power Input - 9 - 36 VDC input range supports power systems on most vehicles and vessels. An included universal power adapter allows 100 - 240VAC, 47 - 63 Hz operation. A DC Vehicle adapter is also included. Antenna Options - Can be used with many antennas, including fixed-mast, mobile fixed-mount, and mobile magnetic-mount models. The Iridium 9555 satellite phone is compact, small, and easy to use but with industrial grade ruggedness, that operates with the only truly global communications network. The Iridium 9555 provides the comfort that can easily make a call even in the harshest conditions anywhere in the planet. The Iridium 9555 Satellite Phone features a redesigned and highly intuitive user interface, making reliable communication more efficient than ever, and user friendly. With 21 supported menu languages, the Iridium 9555 Satellite Phone offers the best in native language support for global phone users. 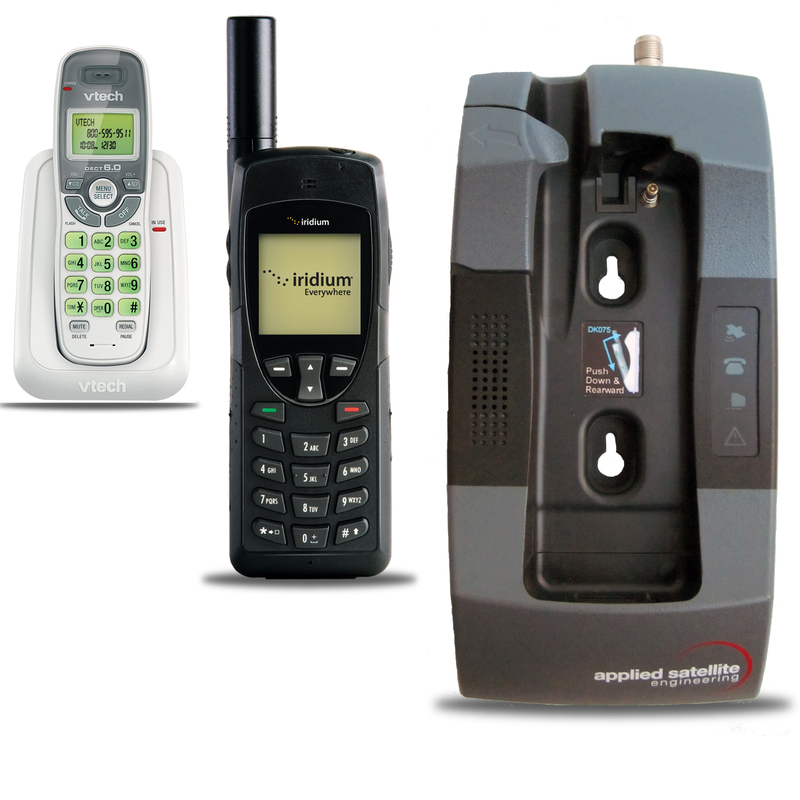 The Iridium 9555 is as rough as other Iridium previous handsets still resistant to water, dust and shock, but streamlined and packed with innovative new features such as an integrated speakerphone, improved SMS and email messaging capabilities, and an upgraded mini-USB data port. Whether you are in Artic, desert, mountains, or a jungle the Iridium 9555 will keep you connected with the most reliable global communications network. The Iridium 9555 is a small powerful satellite phone with a significantly reduced footprint from our previous phone, more hand-friendly form factor, and aerodynamic features such as an internally stowed antenna, this sleek handset is designed to easily go wherever you go. The VTech CS6114 cordless phone. DECT 6.0 Digital technology delivers superior sound quality and range, while ensuring wireless networks and other electronic devices don't interfere with conversations. With the phone's digital security, your calls are digitized and encrypted, making it nearly impossible for someone to eavesdrop. The caller ID/call waiting feature stores up to 30 calls, Last number redial allows you to quickly redial the last five numbers called. The keypad and LCD screen illuminate, allowing for easier viewing in dim light. •Wall mountable, but not on a standard phone wall plate. Click the button below to add the Iridium 9555 & ASE-DK075 Docking Station Bundle-Refurb/New to your wish list.